Oh, Eragon. This book has been on my list since 2009 when I first met my husband. Both being huge readers, we talked about books that we were both into and shared our favorite titles. I was a Twihard through and through at that time but my husband was and still is obsessed with Eragon. From that very first conversation about books, he made it a mission of his to get me to read it. Fantasy, other than Harry Potter, isn't really my thing so I struggle through books like this. I finally pushed that aside, however, and decided to give in and placate him. I watched the movie when it first came out and, according to my husband, this was my first mistake. He hates the movie with a fiery passion. But since I did enjoy the movie, I thought why not? Maybe I'll enjoy the book. I was wrong. Just like usual, I struggled so hard through this book. I first gave it a try with my husband's tattered old paperback copy. I couldn't finish it. It just didn't hold my attention long enough for me to get into the story. I barely made it past the first chapter. Not long after, I fell down the rabbit hole of audiobooks and found myself speeding through books quicker than I've ever been able to (slow reader, here). So I thought, hey, maybe if I'm listening to someone read it, maybe I can do it. And I did, but just like before, I struggled through it. I was doing great for the first half of the book. I was into the story and enjoying it. Then the constant over-description of every little thing got to me. The decently slow pace and wordiness of the book just completely lost my attention and I couldn't stay focused on it. I found myself wanting to listen to something else. So, unfortunately for my husband, I didn't enjoy Eragon. I have read the whole set, but it isn't a tale I want to take part in again. It was good as stories go, but that was quite a few years ago and my reading appreciation has changed somewhat. While I still love fantasy, I find myself reading other genres more often now. Maybe, it's maturity? 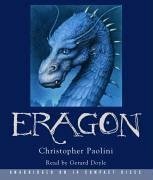 Not sure, but Eragon, to me now, is for younger readers, so I can see where you're coming from.